In 2016 a monument initiative group was set up to consider erecting a monument to the legendary sportsman and philosopher Georg Hackenschmidt (1877-1968) in his home town Tartu, Estonia. The group, led by Olaf Langsepp, a friend of George Hackenschmidt and author of a book about him, formulated a proposal and passed it on to the Tartu City Government. After a year of intense work, which included an architecture and design competition, the Tartu City Government decided that a Monument to Georg Hackenschmidt will be erected at the exact site of his house by the Emajõgi river in the center of Tartu. The monument initiative group is now raising funds and gathering donations for that purpose. All private sponsors, organizations and government institutions will be duly thanked and commemorated. The estimated cost of the monument is 150,000 euros. 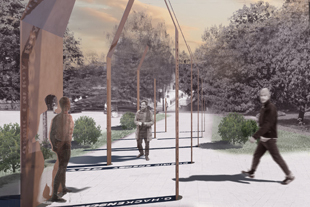 The winners of the competition to create a monument to George Hackenschmidt (1877-1968) are students of architecture Helmi Marie Langsepp and Kristel Alliksaar together with the sculptor Tõnis Paberit; their work is called “Home. Road”. Hackenschmidt was a world renowned athlete and philosopher. The architectural and sculptural conception of this monument expresses both of these aspects. In this winning work G. Hackenschmidt is depicted as a young athlete returning home as if from another space and time. Arches that climb above the sculpture have keywords from his philosophical works carved into the metal so that shadows of the words are projected onto the ground, where they pair or diverge depending of the angle of the light and the time of day. "… Like other great men who were born and grew up in Tartu, and remembered their home town with special warmth, so is also G. Hackenschmidt part of the spirit of Tartu. The concept of the monument “Home. Road” is primarily to give sense to and understand the identity of Tartu. 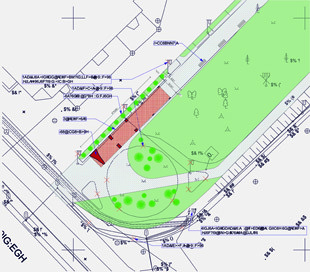 For people of Tartu who love to walk and wander, roads matter more than squares. Bearing this in mind, the sculpture is not placed as a solitary statue in a square, but instead is placed along a section of a road chosen because it can enrich/give an extra meaning to that section. Depending on the direction they face, the arches suggest either the sharp-gabled contours of an imaginary house, or gradually diverge until they ultimately re-emerge as a road. Hackenschmidt, as a world citizen, led most of his life abroad – on the road – but he always carried with him the memories of his home on the banks of river Emajõgi.